Southern investors led the charge at Australia’s largest annual property auction on the weekend, where more than $33 million in Gold Coast property changed hands. Forty-five of 105 properties on the order of sale at Ray White Surfers Paradise Group’s The Event sold under the hammer, with an additional 18 sold prior, bringing the clearance rate to 60 per cent. Negotiations are ongoing for the majority of remaining properties, with RWSP Group CEO Andrew Bell predicting an 80 per cent clearance rate by mid-week. Mr Bell partly credits sales success to the value disparity that continues to exist between the Gold Coast and southern capital markets and the billions of dollars in public and private investment in the city. “Almost every property researcher or commentator is backing the Gold Coast as one of the country’s top performing markets in 2016,” he said. “Stacked up against Sydney and Melbourne, the Gold Coast is very affordable and because we’re still coming off a fairly low base there is more room for capital growth. Mr Bell said the day’s result augured well for the Gold Coast market in 2016. “The Event is widely regarded as a barometer for the local and even national markets in the year ahead, so this result puts us in good stead,” he said. Mr Bell said while the world’s economy continued to show signs of volatility, consumer confidence in property remained strong. “At the end of the day it comes down to where people are going to get the best return for their money,” he said. “Right now it’s not in the bank and it’s unlikely to be in shares. About 2,000 people came through the doors of The Event and the Gold Coast Home and Living Expo throughout the day. There were more than 300 registered bidders, reflecting an average of about three bidders per property. 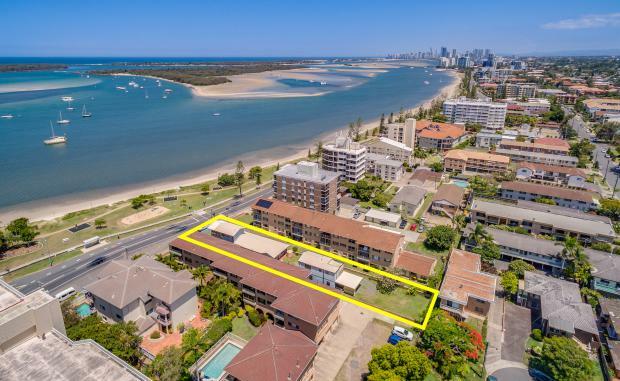 The day’s highest priced sale was $1.2 million for an 875sqm site zoned for redevelopment at 544 Marine Parade, Biggera Waters (feature image). A three-level hilltop home at 38 Albany Avenue, Currumbin for $1.1 million. A family home on 7.5 acres of land at 52 Stuckey Close, Willow Vale for $920,000. A modern duplex at Royal Pines Resort at 6013b The Boulevarde, Benowa for $665,000. A three-bedroom, two-bathroom contemporary apartment at 507/18 Fern Street, Surfers Paradise for $460,000. A one-bedroom apartment at 18/24 Slayter Avenue, Bundall for $185,000.